The IMAX release of Zootopia will be digitally re-mastered into the image and sound quality of An IMAX 3D Experience® with proprietary IMAX DMR® (Digital Re-mastering) technology. The crystal-clear images coupled with IMAX's customized theatre geometry and powerful digital audio create a unique environment that will make audiences feel as if they are in the movie. 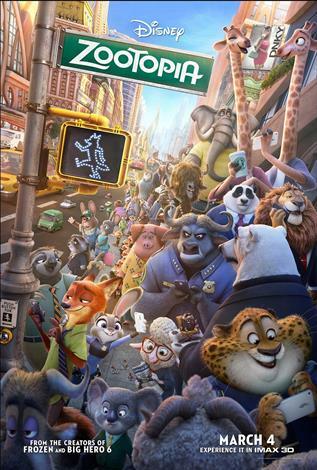 In a city inhabited by anthropomorphic animals, an uptight rabbit police officer is forced to work with a charismatic fox who's been framed for a serious crime in order to get to the bottom of an important case.